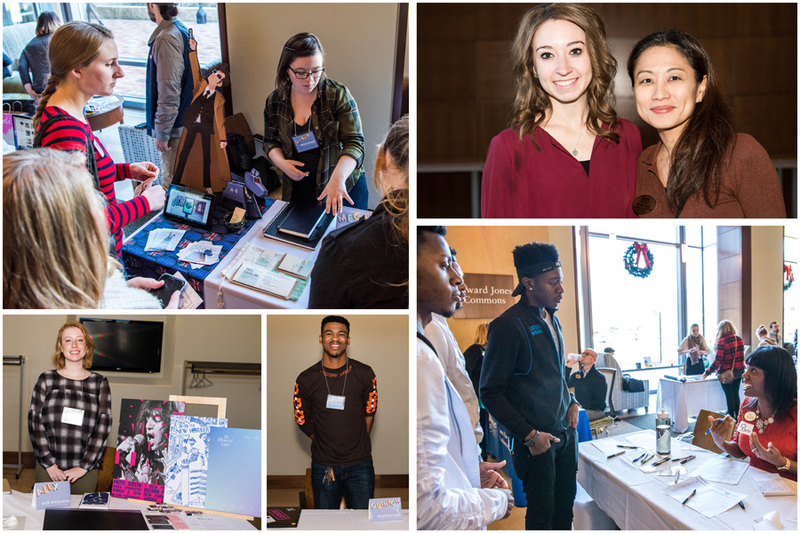 Local designers, art directors, prospective students, alumni, faculty, and staff gathered to commemorate the Fifth Annual Graphic Design Showcase, held Dec. 1, in the East Academic Building's Edward Jones Commons. This event is co-hosted by the Department of Art, Art History and Design in the Leigh Gerdine College of Fine Arts and the Career Planning & Development Center. This year 13 graphic design students presented their digital and print portfolios, while one walked away with a $1000 award presented by the event’s agency sponsors, Momentum Worldwide. David Bannecke, senior vice president group creative director, Zach Lips, Michelle Markee and Paul Wells of Momentum Worldwide, judged all the portfolios, awarding the Momentum Award to Megan Haislar, junior, Graphic Design and Illustration. The showcase also featured the student work of: Tyler Galibert, Brittany Graf, Niki Harris, Madison Lyons, Alen Mujic, Midhat Selimovic, Brennan Stamulis,Kristen Thompson, Quinton Ward, Alex Wieselman, Jodi Woolsey, Scott Blackwell. This collaborative effort, which also included the help of the Office of Admissions, allowed prospective students the opportunity to tour the graphic design studios and meet with faculty and staff of the Art, Art History and Design department. 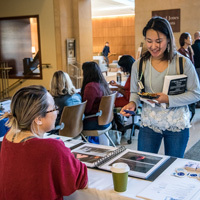 This was an excellent opportunity for Webster University graphic design students to network with local professionals many of whom are alumni, as well as receive feedback on their design work from experts in the field.